Post Tagged with: "Qin dynasty"
Q in the 1st Emperor of China prepared well for the after-life. Throughout his reign he commissioned and built an eternal army of some 6000 soldiers, charioteers and cavalry. The warriors stood in formation, buried at the foot of his tomb, there to guard the Emperor for eternity. But all did not go as planned. Shortly after Qin was entombed chaos descended on his newly united China. Qin’s heirs, wishing to defeat him (even after his death) attacked his after-life defences. History tells that the underground barracks that housed the vast army of terracotta warriors were set alight. Fires smouldered for 90 days, structures around the ornate statues collapsed smashing the exquisite army. The broken soldiers and their bronze weaponry lay buried in ash and rubble. The great mausoleum was forgotten. Two millennia passed. Until in 1974, a peasant farmer, whilst digging a well, found fragments of a crushed warrior. And excavations began. 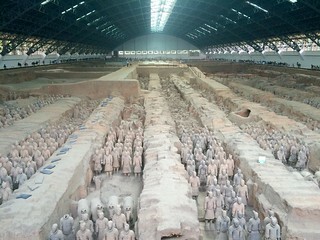 The thousands of individual Qin dynasty soldiers, have been painstakingly pieced together and placed back in formation. They are an awe inspiring sight. But I marvelled just as much when I saw no less incredible bronze weapons that armed the officers. Their swords are still sharp and largely unaffected by the 2200 years that have passed since they were forged. Instead of the green corrosion you’d expect on bronze artefacts the blades actually appear gun metal grey. Why this is the case is something of a mystery. There are reports of an analysis of the artefacts conducted by the Chinese Research Institute of Nonferrous Metals and Chinese Academy of Geological Sciences (although I am unable to find the primary data). The suggestions is that a 10-15 micron coating containing chromium oxide (at up to 2% chromium) was found. The conclusion; for millennia this thin layer protected objects from the ravages of time and chemistry. So where did the chromium oxide layer come from? 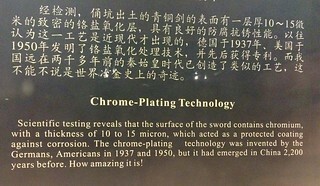 Did the ancient Chinese metallurgists, as suggested by curators of the Terracotta army, really have chrome plating technologies thousands of years before it was developed in the west? Over the intervening time did the chromium shine lose its lustre as it slowly oxidised, resulting in the grey we see today? Is a 10 micron, dilute layer of chromium oxide really enough to impart anti-corrosion properties? Or is there another explanation for the immaculate swords? Professor Walsh notes that the heat from the fires and the presence of carbon would have provided a reducing environment in which chromium atoms could have migrated to the surface of the weapons. There they’d oxidise and form a protective coating … Metals do diffuse over time, so this ‘natural’ explanation is plausible. For me this isn’t a totally satisfying explanation. Largely since it appears, from the items on display, that only the blade is free of corrosion. The hilt has clearly corroded. If the slow migration of chromium to the surface of the blade is responsible why didn’t this mechanism occur elsewhere on the swords? But the idea that Qin’s weapon smiths knew how to apply anti-corrosion layers to their creations seems rather fanciful. Which leaves the above questions unanswered. So chemists, time to reopen discussions. What do you think is going on? Can anyone come up with a way that the ancient Chinese might have deliberately or accidentally protected the weapons? Or what else might have resulted a corrosion free blade, whilst the rest of the weapon is tarnished? P.S. Any Chinese chemists/metallurgists out there who might be able to track down the analysis of the blades?